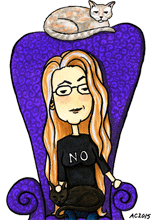 It’s a celebration of purple this month! 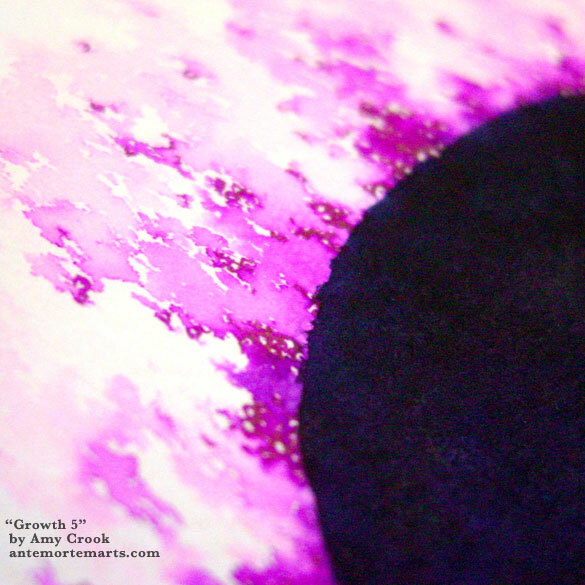 The inner circle moves from deep violet to black etched over with the sheen of purple ink. The outer edges mix the intricate circles grouped together like fish eggs with the splash of brightly-mixed ink, purple bleeding into pink. 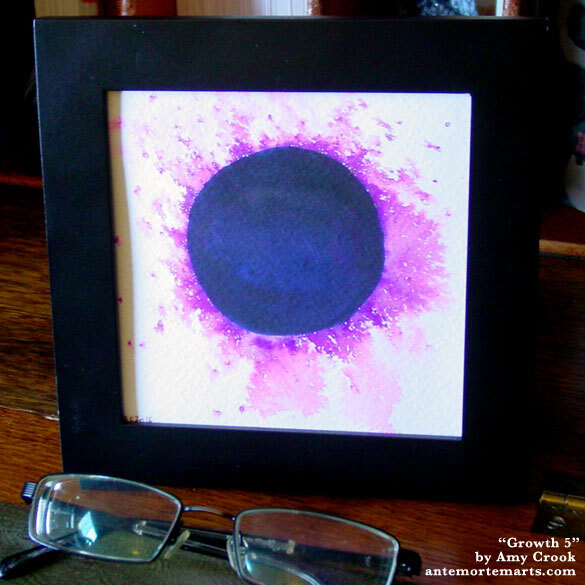 Like all of my Growth paintings, there is a suggestion of sending parts of the central self out into the aether, of reaching into the void despite the obstacles and finding something beautiful in it. 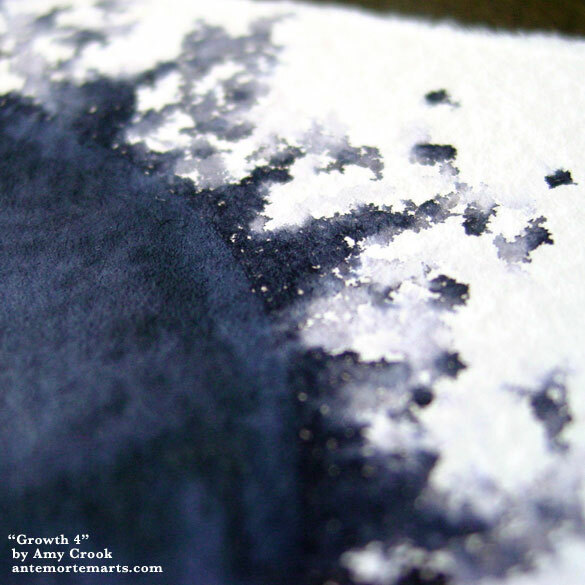 Where in life do you need a little bit of growth? Above, you can see how the purple ink separated into almost luminous pinks, reds, and violets, but there are some little circles left intact to hint at the structures that once were. 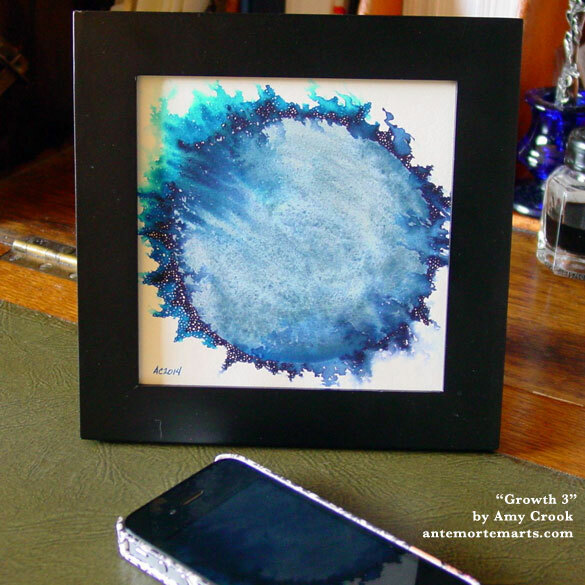 Below, the art is in a small frame, waiting to bring unexpected beauty to a neglected corner of your home. Subtle dark colours bloom into blues and greys and deep, soft violets, and the intricate detail of pen and ink is nearly lost as the paint splash bursts outward from the central circle. This is the 4th installment in my Growth series, with a color palette that hearkens back to the first and a design that evolves visually from the third. 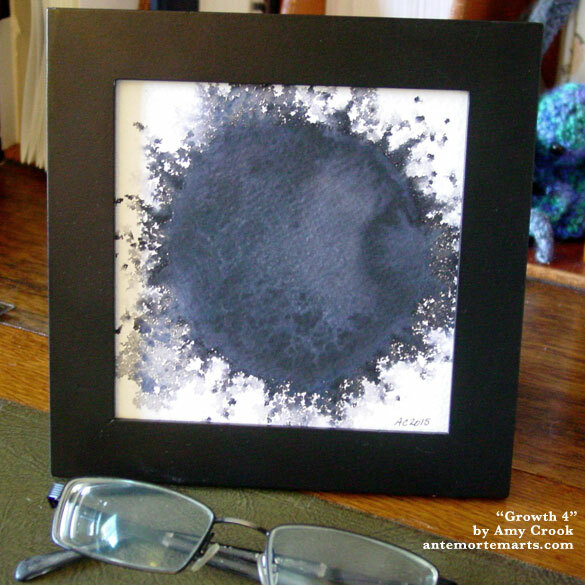 Five by five is quite small, and you can find frames just this size at the big craft stores, so you could tuck it into a bookshelf, put it on a desk, or make it one of a cluster of artworks on a larger wall. Doesn’t everyone need a little Growth in their life? 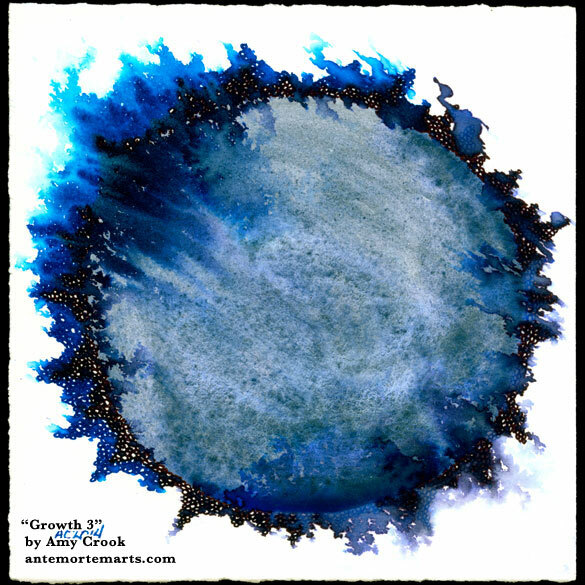 Growth 4, 5″x5″ pen & ink and Japanese watercolor on watercolor paper. 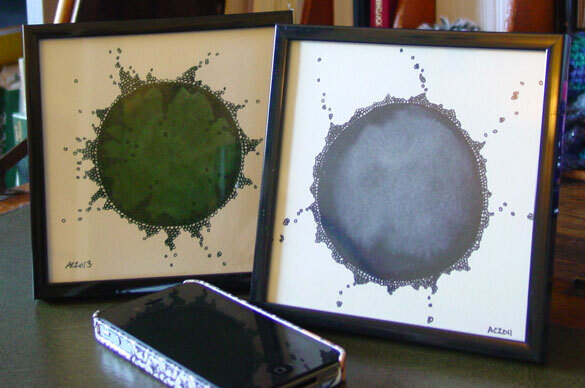 Above, you can see the hints of pen-and-ink circles, blurred by paint but still visible. Below, the painting is in a frame, all of its beautiful texture on display. 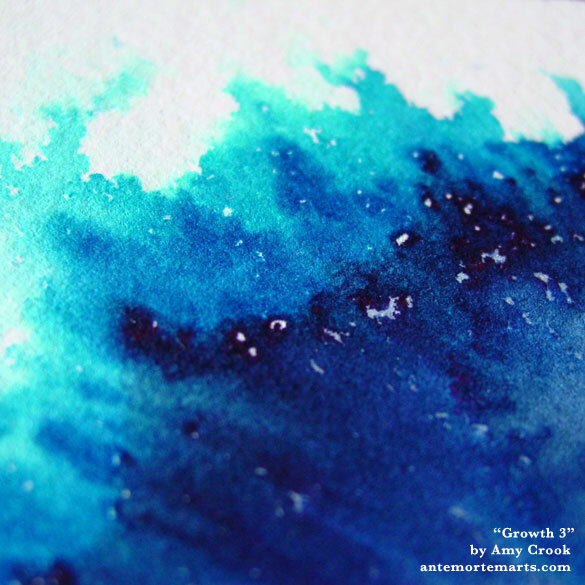 I took the theme of Growth a step further this time, layering the growths themselves in three sets of increasingly light blue, and then blurring them out with water to add a strange spin to the structure of circles within and without. 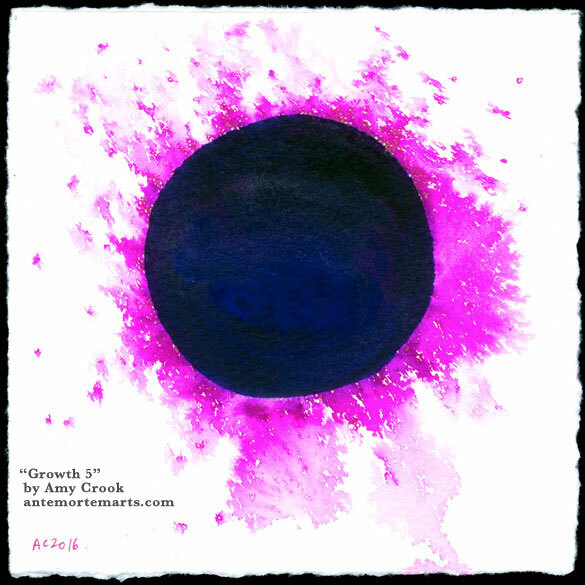 Growth 3, 5″x5″ pen & ink and watercolor on Arches cover white paper. 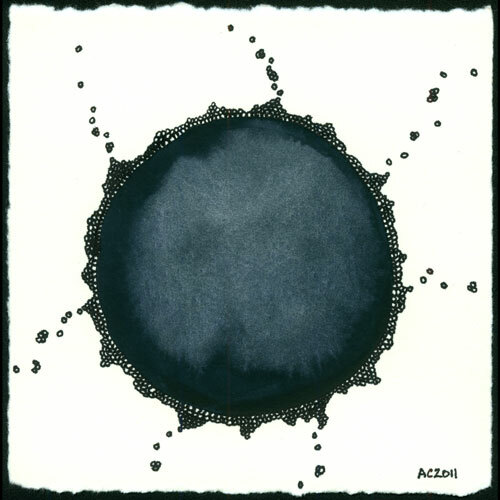 Above, you can see the corona up close, the three layers of ink mixing and blending, but still some of the white central spaces from inside the circles remain. Below, you can see the painting in a frame. It’s small, but it’s fierce! 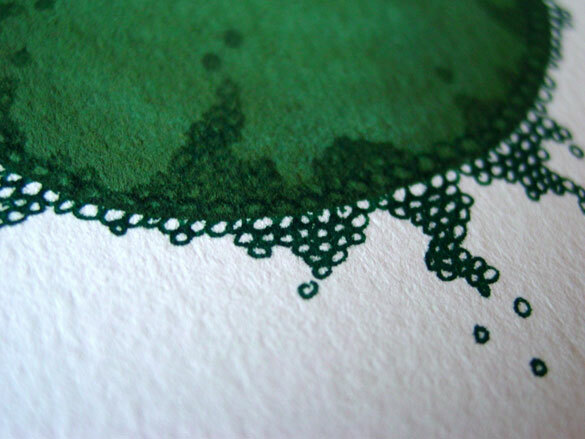 I was playing around with my watercolors, and the deep green circle reminded me of the blue-black center of Growth. 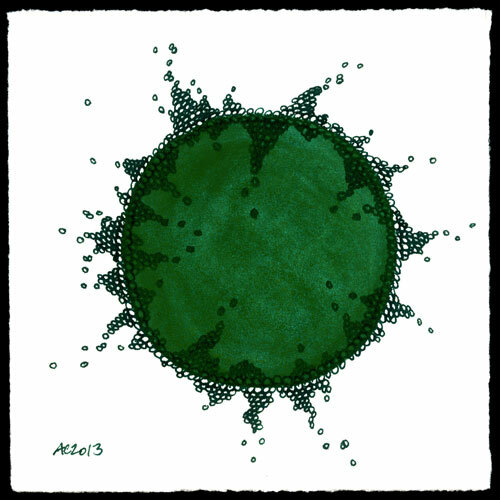 Before I knew it, I’d grabbed my dark green fountain pen and started making two rows of circles this time, inside and out, and then filling in the inner set while the watercolor was still slightly damp, before moving to the outside. 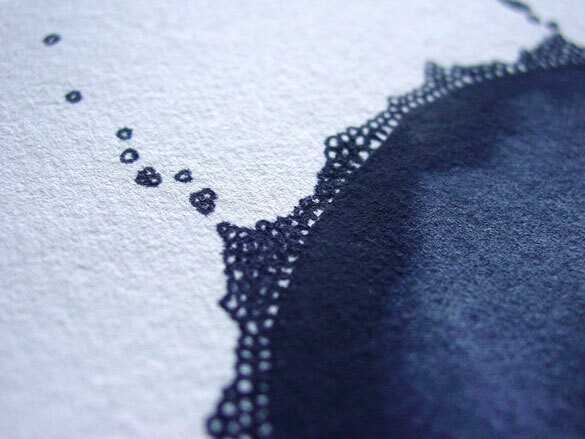 This paper is very absorbent, which gives a softness to the pen lines even on the white. I had to resist the urge to try to create randomness, and instead just stick with something that was interestingly varied to me. Humans do randomness terribly, and I always have to remember that. I found it interesting that the growths came out differently shaped than the original, more towers and less floaters, no long strands of growth reaching out or in. 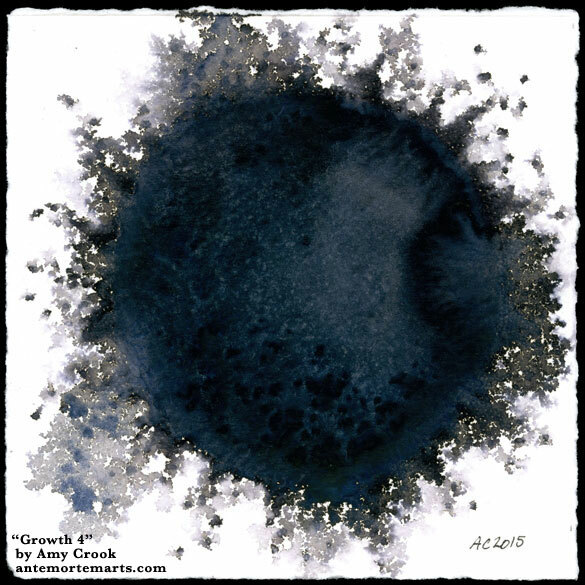 Growth 2, 5″x5″ pen & ink and watercolor on paper. Above, you can see the paired-up circles of growth going in and outward from the double row at the border. 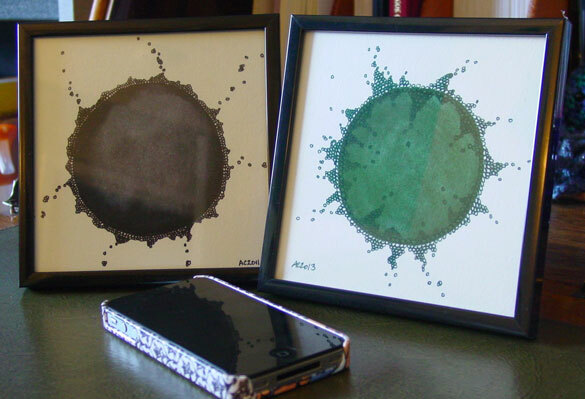 Below, you can see both pieces together in their frames, making a diptych with endless visual interest.